If you are legally separated, but not divorced, it looks like you can choose to file your federal taxes jointly or separately. And, if you’d rather hold on to your cash until the deadline, the 2006 tax year deadline is April 17, 2007. Because this year, April 15 is on a Sunday . . . The IRS is open on April 16, but you can’t have a tax deadline on a Federal District of Columbia Holiday. The State of California set their deadline to April 17, to keep in step with the IRS. NOTE: I am definitely NOT an accountant. I’m just some reasonably clever guy who would prefer to hold on to his cash a few weeks more. Get your own damn advice from an expert, but let me know if I’m wrong, ya? Just for fun, I thought I would give it a try. If you notice any links with a dashed line underneath, that is the Context Links in action. The first thing I noticed is that Adblock Plus will block the context links from appearing. That is probably just as well, but I wonder if there might be a point to writing say, a WordPress plugin to do the processing on the server. I also can not help but wonder if Amazon would look to create context-links specific to a customer’s tastes, so they would prefer to do the highlighting on the client-side. 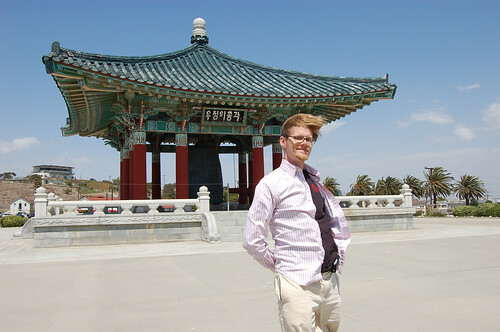 Next, we visited the Korean Friendship Bell, a bronze bell in a beautifully-painted pagoda overlooking the Pacific, which Korea gave us for the Bicentennial. There is a youth hostel next door, which I would check out next time I may decide to visit Long Beach, if I did not already have accommodation. We drove further along the coast, visiting the Wayfarer’s Chapel, which is a beautiful glass church on the coast, designed by Frank Lloyd Wright. We arrived during a wedding, as this is a very popular venue for weddings, so we couldn’t enter the chapel, and the lady at the visitor’s center advised that visits are best planned for odd hours–11am, 1pm, 3pm–since weddings are scheduled on even hours. My original plan had been to take off in the evening and drive about four hours to Las Vegas, and crash at either of two youth hostels I had found online, or perhaps a hotel room, since accommodations are cheaper in Vegas during the week. But I changed my plans to join my friend for a late night of clubbing in Hollywood. Having no particular agenda and an evening to kill, we moseyed further along the coast, and my friend decided to give Santa Monica a shot. We found a parking spot near the beach, and noticed a movie theater. We were just in time to catch “The Namesake” which is a movie we had both wanted to see, and which we both enjoyed. Afterwards we strolled along the beach, catching the sunset. We then embarked upon several hours of groovy carousing in the Southern California style. Despite a mild hangover I managed to pull out of Long Beach fairly early, fortified by bananas, Odwalla, and later a McDonald’s breakfast sandwich and coffee along the way. I arrived in Vegas with the intention of at least having a late lunch on the strip. But I had absolutely no plan, and the place was crowded and confusing and hard to navigate. Nevertheless, I pressed on, found a parking spot at the MGM Grand, and after some fruitless wandering, found a buffet that might have been a good deal had my agenda not been merely to eat quick and hit the road. I figured Friday the 13th must be a good time to at least say I gambled in Las Vegas. On my way out of the buffet I counted to 31 as I walked, and stopped at the slot machine nearest me. I puzzled over the thing a bit, inserted $20, pressed the button just over 100 times, ejected a receipt, and cashed that at the teller for $25.50. This made the buffet a better deal, in my mind, but the truth is that what I mostly lost in Vegas was driving time. Oh well. I pushed North into Utah, making good time. Just after dark I stopped for gas in Elsimore, UT and inquired about local accommodations. The lady suggested a likely-cheap place the next town up the road. I was feeling pretty tired as I hadn’t slept much the night before, and the car has this disquieting habit where the AMP light will come on and the headlights start to flicker while driving downhill a long ways. I figured that if the car was to break down, I’d rather not deal with that in the mountains of Utah at night. But, after a bit of relaxation at the gas station in Elsimore, a bit of coffee, a bit of chocolate . . . I took off down the road, feeling better. I wasn’t sure what I would do, but when the exit for the motel came up I kept on the highway, past the sign that promised no services for 100 miles, and into a few fairly uneventful hours of mountain driving. I missed out on what is probably some gorgeous scenery, but I managed to keep the car running safely through the night through the mountains, despite the flaky electrics. At one point I had to pee really bad so I pulled over and stepped off the highway, and was struck at the vast array of stars in the sky. That made the whole adventure worthwhile. 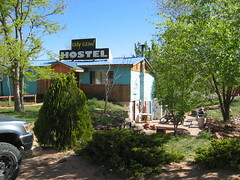 I pulled into the Lazy Lizard Hostel at Moab around 12:30. I felt bad about waking the guy up for a $9 dorm bed. He was way out of it and told me to just take any top bunk in a particular dorm room and we would figure things out in the morning. That I gladly did. It was a rough night at the Lazy Lizard on a thin mattress with a thin pillow. I tossed and turned and just as I was getting my sleep on right my roommates began to stir in noisy ways so that they could get a start on the day’s rock climbing. Americans are not accustomed to the ways of youth hostels, and these guys loved to rifle through their luggage and tromp in and out, leaving the door open. I got up several times throughout the morning to shut the door. At one point I sat up awake waiting for one of the last guys to finish his noisy morning rituals and make his way out of the room. He greeted me and asked if I was a climber. When I told him no he expressed a sentiment that I was probably a nice person anyway, and he was gone, and I rested well a bit longer. Probably around 0800 or 0900 I made my way out of bed, downstairs, apologized for waking the guy up in the middle of the night, and gave him $9.80 (tax, you see) and bathed. I packed up the car, looking forward to a breakfast in town, some hiking, and some scenic driving. I turned the key in the ignition and where the car usually makes a confident rumbling sound to get the engine purring I heard a click. The battery wasn’t dead, but perhaps it was weak. I got the cables out and bummed a jump off a fellow traveler. Nada. A bit longer? No. Could be a bad battery. The hostel guy suggested the auto parts store was a twenty minute walk into town, and the maintenance guy might be going that way in a while and could give me a lift. I said I wanted a hike anyway, so I walked down the highway for not more than five minutes and bought a new battery. The battery was much larger than the one I purchased last year, but I figured bigger is better. The folks at the store lent me a crescent wrench to get the new battery swapped in. I had thought to stow the battery in my backpack, but the battery was too large, and needed to be carried level, and besides it was heavy enough to possibly damage or destroy the backpack that has been my long-time companion around the world. I carried that sucker, taking breaks every hundred feet or so to switch arms . . . a guy was packing something in his pickup truck along the way and he offered a ride, which I politely declined . . . it is not that far. A bit farther and another guy offered another ride in his pickup truck. I accepted, and was dropped off in front of my car. I extracted the old battery, stowing it on the floor in front of the passenger’s seat, and installed the new battery, all charged and ready and–click. “Well, I took an auto shop class twenty years ago . . .” offered the hostel guy. He took a listen to the click. The starter solenoid goes click. Well, you could try replacing that . . . I walked back down to the parts store and easily carried back a starter solenoid. More work with the wrench and nada. Dang. So, I asked a couple from Oregon about the mechanic they were waiting to hear back from. They said the guy had been really busy and might not be able to figure out there car today and the woman had figured out Greyhound tickets so she wouldn’t have to miss work on Monday. Gee. I wandered down the road a bit to what looked like a service station where the guys were working on Jeeps. I explained my plight. The guys said they did Jeep rentals and only knew how to service their own fleet. The more mechanically-inclined fellow affirmed that yes, start with the battery, then the solenoid . . . he recalled that with Fords often if the current from the battery is too low then the solenoid wont send any current to the starter . . . anyway, there’s a really good mechanic a little ways down in a big yellow building, and in front of him is another mechanic who is also pretty good. So, I wandered down the road. Both mechanics were closed. 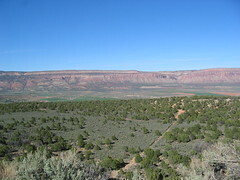 I sighed and wandered back towards the hostel, figuring that worst-case, Moab isn’t such a bad place and the hostel should be cozy for a few days. I badly needed coffee and so stopped by the roadside espresso stand just a little ways down from the hostel. The guy working in the stand was friendly and asked how everything was. I replied that things were good overall, but I had to figure out my car problem. He suggested another guy that might be helpful just a few doors the other side of the hostel, and explained what he called “an old redneck trick” of climbing under the car and shorting the terminals on the starter to get a car started. That sounded worth a try, maybe. He didn’t know if his friend would be open, but he might be. He gave the guy a call and left a message, “but that doesn’t mean he’s closed.” My coffee was on the house. I walked over there and the guy looked pretty closed, which was easy for me to accept, the kindness of the guy at the espresso stand had buoyed my spirits. I wandered back to the car, and poked around a bit. The wires coming off the negative terminal have always been a bit gnarly, so I cleaned them up a bit and gave the ignition another try and the beast started! So, I rolled down to the auto parts store and waited a decent while to return the old battery. (I figured the big new battery a worthwhile investment, anyway.) While I was waiting I ended up talking to this other guy about the various symptoms–for example, the alternator light was on as I left the car idling. He suggested I hit it with a piece of wood and see if it started to whine. I banged the alternator with something and yes, it started to whine and the light went out. “That doesn’t mean its bad,” something about setting it to a known state because the indicator light needed a baseline or something. After we had concluded our respective business he had me follow him over to his shop, where he hooked the alternator up to a load tester, which verified that things looked good. Well . . . I had missed my opportunity for a hike, but I could still have a meal and a scenic drive to Silverton. I popped into the Moab Diner with my maps to consider my itinerary options over a meal. The hostess assured me that a waitress would be right with me. I pored through maps and double-checked calculations, pondering some alternates . . . everything looked good and nobody had yet taken my order. I put my maps away, looked around. I tried making eye-contact with a few waitresses but they all seemed harried and uninterested. I calculated how much time I would need to order and eat and get out of there in order to make it to Silverton before sunset. I figured 3:45 would be my “drop dead” time and five minutes of being ignored later, I finished my ice water and headed out of town, stopping at the espresso stand, where a lady was now working, left a generous tip, and drove off into some beautiful beautiful breathtaking wonderful beautiful scenery. With my failing camera. That’s okay: some things are for my own eyes. It was a good trip down UT-46, which became CO-90, but no gas along the way until I stopped at Naturita. There I found a green dinosaur logo and stopped at an old-school pump at a Sinclair station. The station was with the convenience store, and I asked the lady at the cash register is $3.05 per gallon was expensive by Colorado standards, and she explained that she hadn’t been beyond the neighboring town since Christmas, so she had no idea. Cool! I pushed on and down US-550 South from Ouray, where I calculated I had enough time to make Silverton before dark . . . and I drove up, past signs advising of curvy roads, avalanche zones, and speed limits between 10 and 30 MPH much of the way. Up and up twists and turns and curves and well-plowed snow and ice, and freezing water streaming across the road way. Occasional wild animals and oncoming cars, nobody passed me and I passed nobody. Much of the time it was me, the car, and a blue-gray sky going on twilight. Where the scenery of the afternoon had been beautiful, the scenery of early evening was transcendent. It felt very much as if I had drove clear up into some special realm where we mortals are allowed to tread only in times of fair weather, and with great caution. My experience of the road between Ouray and Silverton was this: sublime. I pulled in to Silverton, which looks every bit an old west mining town with very broad streets. There was snow piled along the streets, and it was nice to be visiting with a proper Winter. I couldn’t figure out the street signs but managed to find the Silverton Inn and Hostel without much trouble. I parked in front, walked right in, studied the notes left to would-be visitors explaining guest cards and rates, toured the available rooms, picked a bed, filled out a card, and took a key. I stopped down the corner where the guy admitted he would have been closed an hour ago, but that he would “make hay” and although he was out of most of his toppings he managed to make for me a delicious pizza, which I enjoyed in the company of his other customers, whose primary interest was skiing. There was further discussion of the guy’s need to sell the property we were on, which included not only the cafe we were enjoying but the energy-efficient house he had built behind it, because he was moving to New Mexico. I then dropped by the bar one block over, and for two or three dollars enjoyed good beer in the presence of a colorful cast of relaxing locals. I turned in early and slept a good, solid, comfortable Winter sleep on a firm $20 bunk. 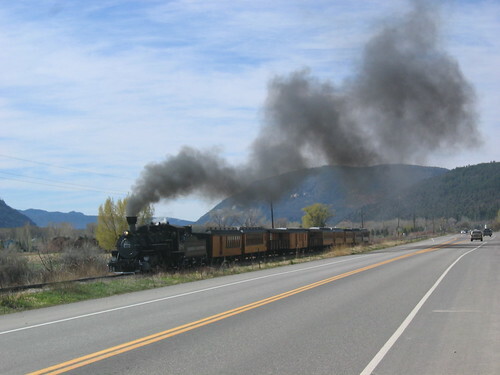 I wanted to get down to Durango, about an hour away, in enough time to catch the day’s scenic excursion ride to Silverton and back on the Durango and Silverton Railroad, before pushing on to arrive in Pueblo. I took a nice hot shower, then packed and loaded up the car. I was concerned at the ice on the windshield, and I without a scraper, but that concern was backburnered because the car didn’t start. I figured I’d revisit the problem after I had grabbed a cup of mind-enhancing coffee. I grabbed my travel mug and headed toward the cafe where I had dined on pizza last night, and encountered a lady who explained that that guy usually opens around noon. I walked over to the main street and up a couple blocks and grabbed some coffee and a muffin at a bustling shop full of snowboarder duuudes. I hustled back to the car, and the same lady from earlier passed by, and I asked about mechanics. There were a couple in town, but they were closed today. You could knock at their house, and they might help, but it is probably better to let them alone. I agreed that I like to have my weekends off, too, and as much as I’d like to spend the evening with the family in Pueblo, I figured that I could get a lot of reading done and rest easily another night in this quiet little mountain town. Maybe I could track down the train station and welcome the steam train as it arrived in this old snowy mountain town, which could be a lot of fun even if I didn’t get to ride. All the same, I fiddled with the wires some more, but I couldn’t do much without even the most basic tools, so I wandered toward the highway were there looked to be gas stations, where I might find a brief diversion, and possibly even something useful. I found someone useful. The guy at the Citgo admitted that this was the first weekend of the season that they were open for weekend service, but that he wasn’t a real mechanic, just the weekend warrior. (The owner / mechanic’s son, it turns out.) He said he had a few ideas that might help, but that he’d have to close the shop for a few minutes . . . I wandered back to the car and a bit later he pulled up to the hostel, cleaned up my ugly battery wires, noting that the one terminal had been overtightened and cracked, so let’s put on a new one . . . explaining that you only have to tighten the terminal to the point where it doesn’t move on the post . . . doesn’t start? Okay, so, you did the right by the battery, and the solenoid, so yeah, its looking like a bad starter. Sure, he could order a new starter and get it replaced during the week, but in this situation, sometimes you could tap the starter a few times with a hammer, and then he crawled under the car on the muddy street, found the starter motor, tapped, got out of the way, and I successfully started the car. He explained where the starter is, and that it looks like a cylinder, and in my case, a very rusty cylinder, and that I could tap it myself if I had to, but that at this point, the starter is likely about to fail completely . . . it might work fine, the tapping trick might work a few more times, but most likely I’ve got just a few more starts, if any, before the thing fails completely and leaves me stranded somewhere. We figured that I might as well keep the engine running and get to Pueblo as soon as possible, where the starter could be replaced under favorable conditions. He reminded me that you don’t actually have to stop the engine to fill the tank . . . I beamed as he modestly basked for just the briefest moment in heroic glory. I got the sense that he might be most content to account the incident as a good deed, and waited just a moment more before I inquired as to whether and how much cash he should charge for his time. He figured about fifteen or twenty dollars. He then, as I figure it, very quickly considered my circumstances versus my poverty . . . computer guy from San Francisco . . . not working . . . going to see Dad . . . nice old clunker . . . is going to need a starter . . . stayed at the youth hostel . . . and set the charge at $15. I headed down the road, and there was still a chance I could make Durango in time to catch the train, maybe, and I thought over whether it would be worth the risk if I could, and concluding that yes, if I made Durango in good time I would risk stopping the car if I got to ride the train, because even if I got stuck, I would have had a good time for my trouble. At any rate, I was still on the highway at 10:00, when the train was set to leave. Several minutes later I noticed some smoke on the horizon . . . I slowed down and listened out the window . . . yes, that was the train coming toward me, parallel to the highway! You know I pulled over to the shoulder and managed to squeeze some pictures out of my dying old camera! And these were the last pictures I ever took with this camera, which has since refused to work at all. My last camera, a Canon S100, died at around the same time as Grandma Howard, so I gifted the-camera-I’d-taken-round-the-world to my Grandma to take with her in her coffin to her next life, which makes me inclined to see changing-cameras as epochal. It had been a weird twist of fate to have been in the Midwest at that time, which allowed me to visit her in the hospital just before she entered hospice, and which allowed me to drive back up to Michigan for her funeral not long after. I was pretty broke that summer, working in the cafe in Champaign, and it wasn’t until I was back at Mom’s house and living on Unemployment Insurance that I dared to buy my Canon S400, which I badly wanted for a trip that Yayoi arranged for us: we drove together in my car to Boston so she could check out a job fair. That was the first road trip that I took with a woman who, when I returned to professional work, I invited to live with me. Later, we would marry, move to California, and become separated. I took a third professional job in San Francisco during the divorce process, and shortly after the divorce concluded, so did my most recent job. So, I rolled through Durango without stopping, and turned East onto US-160. Since I hadn’t stopped to ride the train, I was ahead of time, and perhaps the natural beauty of the mountains on my final leg was further enhanced by mid-day light, as well as my own hunger from not stopping for food, and my eagerness to pull into Pueblo sooner-than-expected, to see Dad and Gwen. That was a good ride, and a homecoming that did us all some good. and hope you might consider us again in the future. Just for fun, I had submitted a resume, to see what random stuff Google might come up with. The reason being that any time I had applied in the past, what always happened is I would hear nothing for a month or two, then I would be contacted by a recruiter for a completely different position, and the recruiter would have no idea about the position I had originally applied for.